This is setup options for SMTP client send method (esmSMTPClient). They are located at Sending tab. 1. 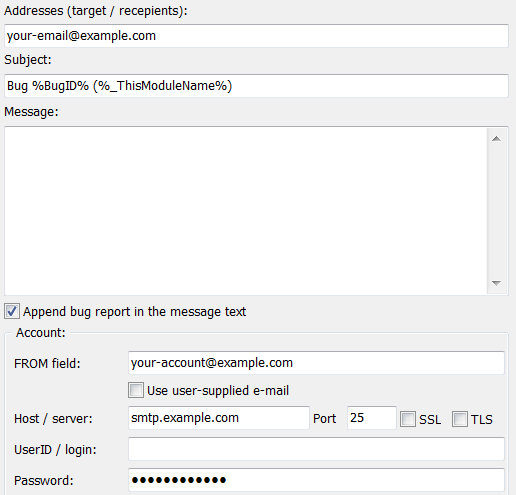 "Address(es)" (.SendSMTPClientTarget) option specifies target e-mail address to send bug report to. Specify here your e-mail address for bug reports harvesting. Multiple e-mail addresses are allowed (separate them with "," or ";"). 2. "E-mail subject" (.SendSMTPClientSubject) option specifies header (subject) for all sent bug reports. You can specify generic static text here (like 'Bug report for Project X') or use a %tag% to generate dynamic subject to distinguish one bug report from another. See using variables for more info. 3. "E-mail message" (.SendSMTPClientMessage) option is optional text of e-mail message (body). You can enter here any text, use variables or just leave this field empty. 4. "Append bug report text in the message text" (.SendSMTPClientAppendLogs) option appends bug report text to the e-mail message (body). If e-mail body is empty - e-mail will consist of bug report text only. If you've entered non-null text - the first will be your text, the next will be bug report text. 5. "From field" (.SendSMTPClientFrom) option specifies your e-mail address. It's your real e-mail account on e-mail server, which will be used to send bug reports. It can be the same as "Address(es)" option, but it doesn't have to. 6. "Use user-supplied e-mail" (.SendSMTPClientUseRealEMail) option allows you to substitute your real e-mail address with customer's e-mail (which can be set via some error dialogs or SetUserEMail function). If you turn this option on - you will see customer's e-mail in FROM field in bug reports. This is convenient. But usually you need to keep this option unchecked, since most e-mail servers will not allow you to send e-mails as from other people. 7. "Host / server" (.SendSMTPClientHost) option specifies e-mail server to use. Please, refer to your e-mail server's support/help to get this value. Usually, if you have account@domain.com, then this value could be smtp.domain.com, mail.domain.com or mx.domain.com. 8. "Port" (.SendSMTPClientPort) option specified TCP port number. Again, refer to your e-mail server's support/help to get this value. Typical values are 25, 587 and 465. 7. "SSL" (.SendSMTPClientSSL) and "TLS" (.SendSMTPClientTLS) options enabled secure mode for e-mail server. Check one of these options only if your e-mail server requires it. Please, see this article to know more about these mode differences. Usually, it's best to turn on "TLS" checkbox, even if your e-mail server doesn't require it. 8. "UserID / login" (.SendSMTPClientLogin) option specifies your login on e-mail server. Usually, it's the same as your e-mail or part of it before @. For example, if you have account@domain.com, then your login will be either account or account@domain.com. 9. "Password" (.SendSMTPClientPassword) option is your password on e-mail server. Currently EurekaLog supports AUTH LOGIN and AUTH PLAIN authentication methods. Warning: your real account's data will be stored inside application. Even if it's encrypted - it's still stored inside .exe, so it can be stolen. DO NOT use your personal e-mail for this. Create a new special account for bug reporting via this method (and be sure to protect it against e-mail change or hi-jacking). • Port 25 will not work. • Alternatively, you can use port 465 with SSL enabled (TLS disabled). • Account name (i.e. without domain part) sometimes can be accepted as login, but we recommend to specify full e-mail address as login. • You must enter "application password" instead of account password, if you're using two-factor authentication. We strongly recommend to enable this additional protection, if you use SMTP client mode in your applications. See also: Configuring other mail clients and Security Considerations. Alternatively, you can use port 25 with the rest of the settings to be the same. See also: Problems with access to Hotmail from other e-mail clients (specifically: Send and receive Windows Live Hotmail e-mails with mail clients). Note: you need Yahoo! Mail Plus account to use external e-mail client. See also: How to access Yahoo! Mail Plus using an email reader. See also: Read and Send AOL/AIM E-mail with Other E-mail Applications. Note: some e-mail servers with web UI requires you to explicitly allow access to mail from 3rd party clients in e-mail account settings. Please, refer to help or support services of your e-mail server.